Despite regular, year-round use of preventives, your pet can still be exposed to ticks, even in your backyard. But did you know you can make your yard less attractive to ticks depending on how you landscape? It’s true! 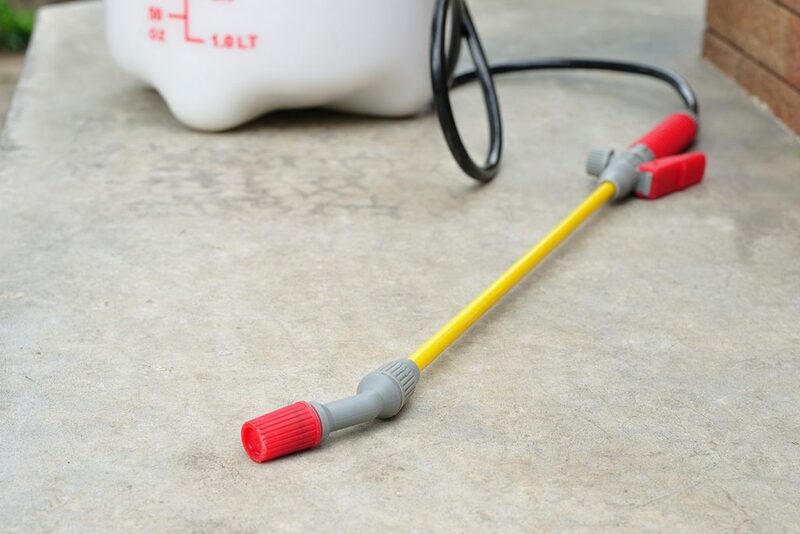 Here are some simple tricks and techniques you can employ this year to help reduce tick populations around your home. Keep your pets and children safe from ticks using these practical landscaping tips. – Clear tall grasses and brush around homes and at the edge of lawns. – Place a 3 ft wide barrier of wood chips or gravel between lawns and wooded areas and around patios and play equipment. This will restrict tick migration into recreational areas. – Mow the lawn frequently and keep leaves raked. – Stack wood neatly and in a dry area (discourages rodents that ticks feed on). – Keep playground equipment, decks, and patios away from yard edges and trees and place them in a sunny location, if possible. – Remove any old furniture, mattresses, or trash from the yard that may give ticks a place to hide. We have both natural and conventional products. 1. Tick Zone – Avoid areas with forest and brush where deer, rodents, and ticks are common. 2. Wood Chip Barrier – Use a 3 ft barrier of wood chips or rocks to separate the “tick zone” and rock walls from the lawn. 3. Wood Pile – Keep wood piles on the wood chip barrier, away from the home. 4. 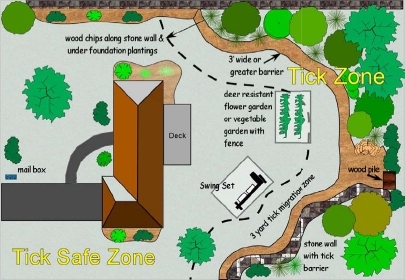 Tick Migration Zone – Maintain a 9 ft barrier of lawn between the wood chips and areas such as patios, gardens, and play sets. 5. Tick Safe Zone – Enjoy daily living activities such as gardening and outdoor play inside this perimeter. 6. Gardens – Plant deer resistant crops. If desired, an 8 ft fence can keep deer out of the yard. 7. Play Sets – Keep play sets in the “tick safe zone” in sunny areas where ticks have difficulty surviving. Our Integrated Tick Management programs are customized for each properties’ specific needs, by identifying areas that are most likely to harbor ticks waiting for their next blood meal, and areas that people and pets frequent. By targeting these areas, we safely reduce tick populations, thereby reducing the chances of you and your pets being bitten by a tick. We offer either conventional and organic treatments or a combination to treat for suppression of ticks and treat a minimum of two times per year when tick populations are at their peak. In addition, we offer Damminix Tick Tubes, which target nymph ticks carried by field mice. 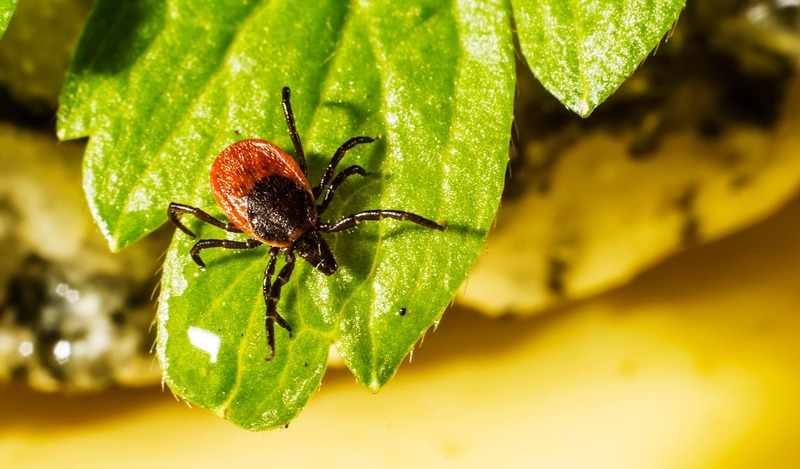 It is important to reduce the chance of mice spreading ticks on your property because the mice are the principal natural reservoir for Lyme disease bacteria and the tubes are placed at specific times in the tick lifecycle in tick habitat areas on your property.